Power Rangers (2017) – Beats All Other Installments in the Series! You are here: Home / Media Reviews / Power Rangers (2017) – Beats All Other Installments in the Series! High school outcasts stumble upon an old alien ship, where they acquire superpowers and are dubbed the Power Rangers. Learning that an old enemy of the previous generation has returned to exact vengeance, the group must harness their powers and use them to work together and save the world. KIDS FIRST! Film Critic Gerry O. comments, “There have been many movies, shows and stories related to the Power Rangers series, but by far, Power Rangers (2017) beats all other installments in the series.” Arjun N. adds, “Saban’s Power Rangers is a great romp of Power Rangers’ fan service. I found the acting and special effects to be incredible throughout this movie.” See their full reviews below. There have been many movies, shows and stories related to the Power Rangers series, but by far, Power Rangers (2017) beats all other installments in the series. This doesn’t mean Power Rangers (2017) is perfect. The film has a fair share of flaws that could have been fixed, but for the most part, it leaves a pleasant and positive impression. This film has plenty of action, with lots of comedic scenes to illicit frequent giggles from the viewers. Some romance blossoms between the characters and it is filled with a dramatic feel throughout the entire film. The story begins when five kids, despite having no previous connection with each other, all end up at a gold mine, where a strange rock with even stranger coins is revealed. Each of them take one coin and attempt to escape from the mine’s security. Sadly, while escaping, they get hit by a train in what would be a lethal crash. Yet, all five wake up the next day completely alive. More important, now they all share super hero strength, can jump really high and more. Soon the five learn that they are the Power Rangers and need to defend a crystal in Earth’s crust that allows life to exist on the planet, from an evil woman named Rita Repulsa (Elizabeth Banks). 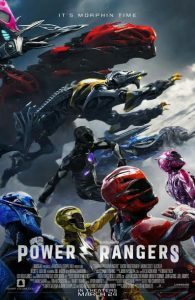 Power Rangers (2017) has entertainment value and fans of the brand will especially enjoy it. There are many aspects that come out perfectly. My favorite aspect, by far, is the cinematography. Every single shot in the 120 minute run time is wonderful, from twisting shots that give the viewer a first-person perspective, to shots flying through the air to give a sense of scale. Another aspect that the crew achieved successfully are the costumes. The Power Rangers look epic and the reveal of their costumes were cheered by viewers in the theater because of how iconic the designs are. The plot also has many good aspects. They don’t give the characters’ super powers and super suits at the beginning. For most of the film, you have five teenagers who are clearly mortal. This gives the viewer time to bond and connect with the characters and allows a sense of realism. The plot does have its downsides. Even to people who have no idea who Power Rangers are, the story is quite predictable. From the first time they give information about the conflict in the story, I knew exactly how the adventure would turn out. One aspect that surprised me was the special effects. The designs of the monsters and robots all look very real and impressive, but their placements in the real world look forced and somewhat fake, and there are many times where it’s especially obvious to the viewer. Despite all these flaws, the acting is quite phenomenal. I love the way every character comes to life, and how the actors are able to transform. One character that I thought could be improved is the villain, Rita. The back story in Power Rangers (2017) is very vague, and turns her into another “good guy turned evil and now she is insane” example. This has been overused in movies, especially when it comes to stories about super-heroes. I do appreciate how diverse the background stories of these characters are and how in tune with today’s world they are as well. My favorite scene has to be the compilation of clips where the five realize their powers. Of course, they wake up thinking that the previous night’s deadly train crash was simply a bad dream, but they soon start realizing something is very wrong. Not only are the stones from the previous night still in their pockets, but throughout the day, it becomes very clear that their strength has exponentially grown, and they are now stronger and more fit then the strongest people on Earth. I chose this scene because the acting and cinematography work together very well in these clips to show the true confusion on the characters’ faces. You really feel like you are part of the scene, instead of simply watching it. This film has one major change from the older films. It is no longer appropriate for younger kids. They portray Rita in an almost horror-like way (which comes out stunningly) and, there are some scenes with adult language and slightly adult references. I recommend it for ages 12 to 18 and give it 3.5 out of 5 stars because of its many flaws, like the special effects, storyline and some of the characters. However, Power Rangers (2017) is still enjoyable to watch and really does justice to the series. It is in theaters now so, go check it out. Saban’s Power Rangers is a great romp of Power Rangers’ fan service. I found the acting and special effects to be incredible throughout this movie. This will appeal to all Power Rangers’ fans. This film is about five teenagers, Jason (Dacre Montgomery), Kimberly (Naomi Scott), Billy (RJ Cyler), Zach (Ludi Lin) and Trini (Becky G.), who are all misfits. The five come across stones of the Power Rangers, an order of people who protect Earth, and they take these stones. The next day they wake up with superpowers. They go back to find an underground lair with a robot Alpha 5 (Bill Hader) and a former Power Ranger in the form of a talking wall, Zordon (Bryan Cranston). Zordon warns them of an imposing threat, Rita Repulsa (Elizabeth Banks), who has the power to destroy Earth. This group of misfits must learn to overcome their problems to become the Power Rangers and defeat Rita Repulsa. Dacre Montgomery presents leadership yet also being a troublemaker in his role as Jason (Red Ranger), and instead of falling to the stereotypes of being the bland leader who gives rules, he presents a charisma in his character. Naomi Scott as Kimberly (Pink Ranger) is fantastic in presenting a fierce yet caring Power Ranger. RJ Cyler as Billy (Blue Ranger) is my favorite character in the movie due to his comic relief. Ludi Lin as Zach (Black Ranger) presents a careless, yet quick Power Ranger. Becky G as Trini (Yellow Ranger) completes the team of Power Rangers. Elizabeth Banks can be a little bit too over-the-top with her villainous Rita Repulsa, who is horrifying most of the time but funny in the most unintentional parts. The direction of the movie by Dean Israelite is fast paced with every character and especially during the action scenes. The special effects by Zoilo Abad are exceptional with the details on the costumes taking the highlight. My favorite scene is the final battle with Rita Repulsa in the Power Rangers’ mech suits due to the breathtaking special effects. The movie’s message is about teamwork being the solution to the problem because the team is only able to defeat Rita Repulsa by working together as a team and using tactics they learn together. I give this movie 4.5 out of 5 stars and recommend it for ages 10 to 18 due to the intense action and language. This film opens is in theaters now, so go and check it out, if you want a mighty morphing time.